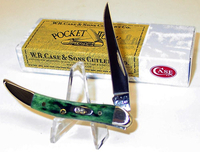 Pocket worn Bermuda green bone. TRU sharp surgical steel, peach seed jig. 3" (7.62cm)closed. 1.0 oz.